As a profession, psychologists have gone through some polarising experiences of late. One could be forgiven for observing that pockets of disharmony exist despite the challenges; however, this September conference was not one of these. Organised by the British Psychological Society's Division of Clinical Psychology, this conference showcased practical projects co-produced by psychologists and 'experts by experience'; a distinction which was soon to be dispensed with by compere Mark Brown (Mental Health Activist and founder of the e-magazine 1:4). This is the first event of its kind within the East of England Branch of the Division of Clinical Psychology, and it was clear from the onset that any preconceptions regarding those who identified themselves as academics and practitioners, and those with lived experience, were going to be tested. In his opening speech, Brown set the tone by observing that none of us is immune to mental distress. This event was to be about eliminating the false divide between experts by training and experts by experience and would emphasise the collaborative nature of ‘mental health stuff’. It offered no illusions as to the ‘romantic’ nature of co-production, however: it is hard and messy work, and is by no means a panacea for all ills in a joint health and social care agenda. Co-production rejects the notion that one party can make all the important decisions on behalf of another. Enlightenment comes with the realisation that whatever your acquired expertise may be, professionally or experientially, you become increasingly aware of how much you don’t know. This was beautifully illustrated by Debbie Debbage and Wendy Franks’ work on ‘Pregnant women’s mental health’, through which Wendy gained her PhD. 'Don’t ever do a PhD,' she counselled: 'it’s horrible.' The duo’s refreshingly frank account of what they had learned from the co-production about each other, and the process itself, rather than from their research results, was, as Debbie quipped about herself, 'once heard, never forgotten'. Her brief chronicle of her own postnatal depression and her confession that she 'didn’t understand a word Wendy said at first', were at times no less poignant than Wendy’s description of her struggles as a psychologist to obtain funding for participatory research. I guess that’s the point. Whether it’s about overcoming the hurdles of doing research and hearing the raw stories, or about struggling to relate to your newborn child, these are all formative experiences, and any attempt to differentiate between the person who is being paid and one who isn’t fails to take into account that great leveller – the emotional experience of it all. Mark Brown cautions, however, against succumbing to the 'Mills and Boon' romance of it all and losing sight of the obstacles to co-production, of which there are many. In Nick Yeates and Katherine Gilmartin’s presentation on ‘Finding a voice’, the power differential was handled sensitively and reflectively by Nick, who, faced with an illustration of a disembodied angry-looking washing machine about to impale the head of a distraught depiction of Katherine on screen, declared, 'I know my wife feels like this when she has to do four loads of washing a day.' You really did get the impression that he cared about and understood the difference between his position and hers. And co-production is different from the therapist-patient relationship, yet Katherine’s comment that finally getting to exhibit her work made her realise that she was 'moving from one scary edge to another' gave one the impression that she might also have been talking about going into therapy. This initiative has given rise to further projects in Norwich city centre, one of which is the planned UEA sculpture. Not all projects need huge funding: Mairi Emerson-Smith, for example, operating within the paediatric health setting in South Essex, has developed an interactive diabetes platform on Facebook in order to reach as many young people as possible. The morning session concluded with a contribution by creative artist and rapper MC Will (Will Randall), who drew on his own personal journey for a rap entitled 'Keep calm and talk about it'. I was struck not only by the determination of the professionals (who clearly had issues of organisational accountability to contend with) but also by the dogged commitment of the experts by experience to see those professionals through projects without allowing them to give up. This event showcased successful projects that can be openly discussed and out of which real friendships have been forged. Many projects, by contrast, fall by the wayside because at some point the participants come to the realisation that 'you can’t get there from here' and give up, exasperated perhaps by rules and regulations that were originally created with the intent of precluding potential harm. As Peter Cairns said, to some extent you have to 'jump in [to co-production], not knowing what will happen'. A collaboration of his in Great Yarmouth highlighted how many NHS and voluntary sector staff are running on empty when trying to address complex needs of others. Following lunch, the afternoon session offered participants the choice between five workshops covering different aspects of the co-creation process. In Workshop 1, Esmee Henstra and Rebecca Rollinson demonstrated how journaling can be used to explore some core themes around co-production. Workshop 2, delivered by Richard Evans and Oz Osbourne, explored how shared interests as well as hidden talents can be discovered through developing the skill of face-to-face conversation. 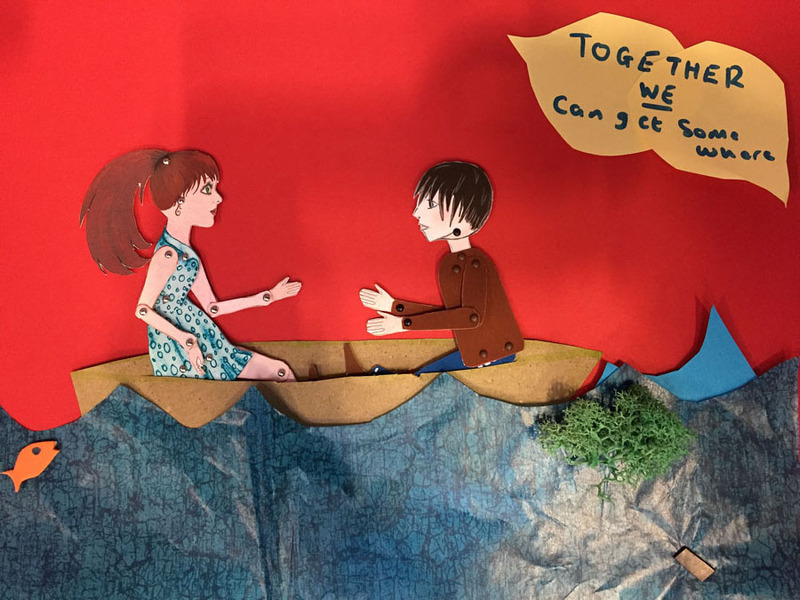 Verity Smith and Anastacia Tohill, who led Workshop 3, used stop-motion animation to explore approaches to meaningful co-production. Workshop 4, led by Laura Marrows and Lin Stevenson, focused on collaboration, communication, creativity and co-production through the creation of paper sculptures. Meanwhile in Workshop 5, rapper MC Will and Dr Danny Taggart explored creative collaboration through Hip-Hop. Having transitioned from "expert by training" to "expert by experience" after sustaining a TBI in an RTA, I am well aware of the challenges on both sides of the "divide". Co-production can indeed by very hard work at times. However, given the range and quality of the benefits which can result - and the economic climate we are in - co-production seems to be a "no-brainer". More conferences like "Creativity in co-production" are needed. Thank you for taking the time to reply Richard.I am one memebr of the organising committee and will feedback your helpful comments and suggestions to the other members.